As I noted when the first Sexton kit was released in December 2012, while the US had provided the American M7 105mm HMC (“Priest”) to the Commonwealth forces, it was not popular due to the fact that 105mm was not a standard British caliber and they preferred the 25-pdr gun/howitzer as a standardized weapons system. 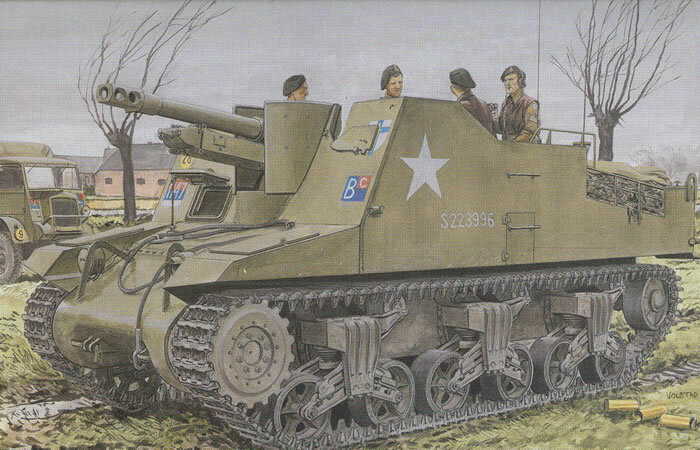 So experiments were carried out to adopt the same concept and layout of the M7 Priest to use the 25 pounder on a Canadian Ram chassis (basically the same M3 chassis used for the M7). While the directions offer the hallmarks of a very late production vehicle – “upswept” trailing bogies with “spoked” welded road wheels, “solid” drivers, welded idlers, cargo rails on either side of the engine deck, the kit does provide for the earlier “flat” return roller M4 style bogies, the noted CDP tracks with correct pattern drivers, and other detail differences. I am no expert on Sextons, but it would appear if this kit has some late-model features they can be removed with relative ease to backdate the vehicle to anyone from production serial number 126 onward. These apparently include the stowage bins at the rear of the hull which were added during the production cycle but are not seen on all wartime Sextons. Also, there are no Bren guns provided for the hull even though the mount bases are present. The model uses the hull from a DML M4 early production version with binning molded onto the floor. The kit also comes with the large sprues for the M4 generic suspension with different styles of wheels and “flat” bogies plus the add-on sprues for the “spoked” wheels and “upswept” bogies. The DS Plastic tracks are two-piece runs in this kit, which may make them easier to shorten than some of the one-piece runs. Unlike the helpful hints in their 1/72 scale kits DML does not tell you how long they have to be to give a tight but correct fit, so the modeler will have to trial and error (these usually run a bit long and have to be shortened, but as the plastic can be cemented together with styrene cement it usually is not difficult to fix). Design credit goes to Hirohisa Takada, but I know several others also participated in the research and design work on these kits. Four finishing options are provided: 86th Field Regiment (SP) RA (Hertfordshire Yeomanry), 2nd Army, Northwest Europe 1945 (S233996, white stars, flash number 147, Bc); 5th Field Regiment (SP) RHA, 7th Armoured Division, Northwest Europe 1945 (S234682, flash 76, red jerboa, Hh); 1st Artillery Regiment, Motorized, 1st Polish Armoured Division, France 1944 (S234087, black and green camouflage, white stars); 23rd Field Regiment (SP) RCA, 4th Canadian Armoured Division, Northwest Europe 1945 (CS234155, flash 76, A7, “Roger”). Markings are on a nicely done Cartograf sheet. Overall this is a bit nicer kit than the first Sexton offering and gives more flexibility for making a wartime vehicle.